RBC Roofing converted from a general contracting company that was established in 1990 to a quality based roofing and gutter contractor in Fort Worth TX, and the local area, in 2002. RBC is partnered by a Granbury High School and Tarleton College graduate father and his son who has extensive knowledge in insurance requirements pertaining to damage as well as age, color, and brand recognition of all roof types. The team saw the needed to elevate the integrity and stability of the Granbury and surrounding Dallas / Fort Worth area roofing image. The owners and the company’s sales force strive for opportunities to develop relationships with our clients and other industry professionals such as insurance agents and realtors. Until recently, when Gutter Helmet, America’s #1 Gutter protection company, awarded RBC Roofing the exclusive North Central Texas dealership, we have been a referral-based business. Our company is growing and expanding its horizons. Through this exciting endeavor our original goals remain. We desire to provide outstanding roofing products and options coupled with industry leading Gutter Helmet’s gutter guards. 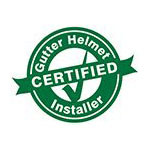 Gutter Helmet brings with it the promise of lifetime protection and peace of mind. Two things we work hard to achieve in every job we do from a simple roof repair to gutter protection. With high quality products and a focus on superior customer care, we have been able to extend our service offerings to more and more homes across North Central Texas. We always aim to earn the trust of our clients by empowering them with knowledge. We will make every effort to retain the principles that have provided us with 14 successful years of recommended business. Rest assured when you choose RBC Roofing, you will receive the attention and dedication you and your home deserve! Call RBC Roofing, your local roofing and gutter contractor in Fort Worth TX, and the local area, today to schedule a free-in-home consultation or fill out our online form. Let us know how we can help protect your home with gutter guards or with any other of our services.